Our bin stock solutions range from basic pigeonhole bins to complex production-line systems, but all are backed by the same-day inventory and hands-on service of our local stores. Choose who monitors the inventory, generates orders, and puts the product away. We will tailor a solution that keeps the right amount of product flowing, when and where you need it. Each of our 30,000-plus customer bin stock programs is unique, but all share a common foundation. That includes a labeled location for each part, a targeted min/max inventory range for each location, and a nearby Fastenal branch to stock the product and keep it flowing. Our local presence enables us to tailor a solution that meets your needs for delivery, service, and control. Your local Fastenal branch representative monitors your bin stock inventory. You review and approve the orders via your Fastenal.ca account. Your Fastenal representative will then deliver and put the parts away. New storage equipment, professional labels, and custom signage can be provided free of charge as part of the local service agreement. If you would prefer to monitor and generate orders using your own employee labor, Fastenal will organize and label your part locations and provide you with an iPod-based scanning solution. Once the system is in place, we can either ship orders to your dock or put them away at the point of use, depending on your needs. 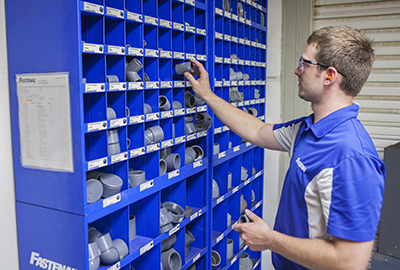 Fastenal creates labels, puts labels on bins, and loads parts to Fastenal.ca. Use your iPod device to scan preset amounts for single-scan use, or adjust amounts as you scan. Use the device to review and submit orders via an active internet connection to Fastenal.ca. 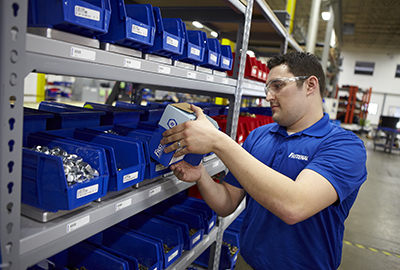 Fastenal provides usage reporting by location and reccomends opportunities to optimize min/max levels, standardize parts, and make other improvements to the program. In short: WE implement the system, YOU do the scanning and ordering, and WE provide local inventory and service to keep the product flowing. This is a great fit for union environments, high-security facilities, and any business that prefers a customer-managed, Fastenal-supported inventory solution. This innovative bin solution utilizes weight sensor technology to provide a real-time view of your inventory levels across multiple locations. This is ideal for critical and high-value products that require enhanced visibility and service. Reorders are automatically submitted to your servicing Fastenal branch(es) based on the min/max levels that you have set. Simply log in to your Fastenal.ca account to view your current inventory levels and adjust your reorder triggers based on changes in your production needs. 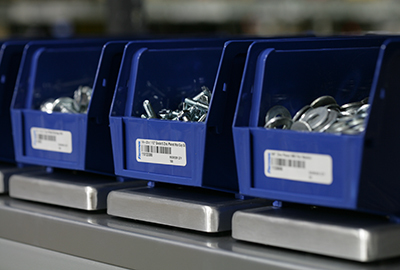 The FAST Scale solution monitors your inventory levels and syncs the data to Fastenal.ca. 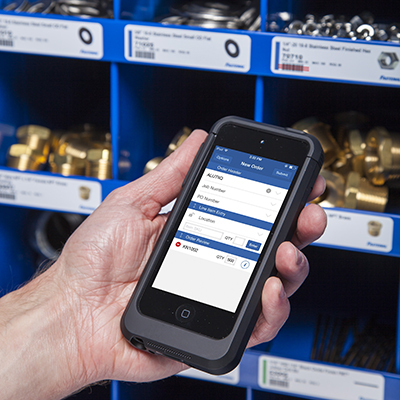 This enables you and your servicing Fastenal branch to view real-time inventory levels anytime, anywhere. Color-coded icons make it easy to check each product's inventory “health” at a glance. Detailed reporting allows optimization of inventory levels and reorder points. You can adjust your min/max reorder triggers anytime at Fastenal.ca based on usage patterns and upcoming production needs. Backup inventory is stocked at your local Fastenal branch. When inventory dips below your current target minimum level, an alert is automatically sent to the branch, prompting your representative to visit and refill the bins. This is a completely hands-free, paper-free replenishment process.